The Flagstaff City Inn Motel is a budget accommodation property that is superbly located in the Melbourne CBD. It is in the perfect location for both the tourist and business client alike because staying in the Melbourne motel accommodation places you within easy walking distance of the Melbourne city centre and close proximity to all the wonderful tourist attractions that Melbourne has to offer. For those budget conscious travellers who want to venture further afield you will find that the Flagstaff City Inn is only a short walk to the Docklands waterfront precinct, Etihad Stadium, Flagstaff Gardens, the popular Queen Victoria Market and the Southern Cross train station and interstate bus terminal. Also the Melbourne Airport is just a short drive away from the Flagstaff City Inn Hotel. The Flagstaff Motel offers guests very comfortable and affordable hotel accommodation in Melbourne, ranging from budget single rooms to luxury 2 room suites. Most of these budget hotel rooms open onto a delightful, spacious courtyard which is a rare and charming luxury in the heart of Melbourne CBD. 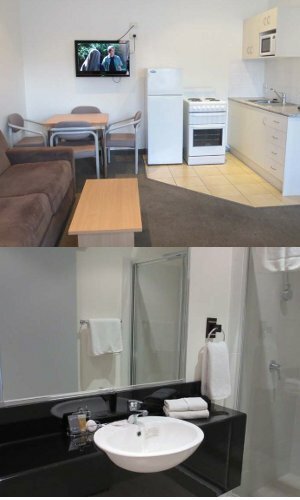 Double Hotel Room - This budget hotel room features a Double bed, private ensuite bathroom, air-conditioning, heating, broadband internet access, DVD player, tea & coffee making facilities, hair dryer and is just a short walk to Etihad Stadium Flagstaff Gardens & the Queen Victoria Market. Twin Hotel Room - This hotel room has a Double and Single bed as well as ensuite bathroom, air-conditioning, heating, broadband internet access, DVD player, hair dryer, tea & coffee making facilities and the room open into a large courtyard. Family Hotel Room - This spacious hotel room can sleep up to 6 people on King, Double and Single beds. It also has kitchen facilities so that you can cook for the family, a lounge room, family sized bathroom, air-conditioning, internet access, DVD player and cable TV. Executive Spa Hotel Suite - This spacious hotel suite has the choice of a King size bed or 2 single beds, an ensuite bathroom with full corner spa bath, air-conditioning, internet access, ironing facilities, DVD player, hair dryer and tea & coffee making facilities. 1 Bedroom Apartment - This serviced apartment has a King siza beds and a double sofa bed. It also features a private ensuite bathroom, air-conditioning, broadband internet access, living room, DVD player, kitchen facilities, phone, alarm clock, ironing facilities, hair dryer and is just a short walk to public transport, shops and cafes. 2 Bedroom Apartment - This spacious apartment has 1 Queen bed in each of the two separate bedroom as well as, a separate lounge room, kitchen facilities, air-conditioning, heating, broadband internet access, phone, ironing facilities, DVD player, family bathroom, hair dryer and is close to the city.